Four children in a wagon pulled by two donkeys, circa 1905. The first Pieds-Noirs were the French Army of Africa personnel's children. ^ 1.0 1.1 pied-noir. Oxford English Dictionary, 2nd Edition XI. Oxford, United Kingdom: Clarendon Press: 799. 1989. ISBN 0-19-861223-0. ^ 2.0 2.1 2.2 2.3 2.4 2.5 Naylor, Phillip Chiviges. France and Algeria: A History of Decolonization and Transformation. University Press of Florida. 2000: 9–23, 14. ISBN 0-8130-3096-X. ^ Cook, Bernard A. Europe since 1945: an encyclopedia. New York: Garland. 2001: 398. ISBN 0-8153-4057-5. ^ 4.0 4.1 4.2 4.3 4.4 4.5 4.6 4.7 Smith, Andrea L. Colonial Memory And Postcolonial Europe: Maltese Settlers in Algeria And France. Indiana University Press. 2006: 4–37, 180. ISBN 0-253-21856-X. ^ 5.0 5.1 5.2 5.3 Shepard, Todd. The Invention of Decolonization: The Algerian War And the Remaking of France. Cornell University Press. 2006: 213–240. ISBN 0-8014-4360-1. ^ pied-noir. Dictionnaire Historique de la langue française 2. Paris, France: Dictionnaires le Robert: 2728–9. March 2000. ISBN 2-85036-532-7. ^ Francparler.com. Origine de l'expression "pieds-noirs". ^ Lapidus, Ira Marvin. A History of Islamic Societies. Cambridge University Press. 2002: 585–600. ISBN 0-521-77933-2. ^ 10.0 10.1 Country Studies Program; formerly the Army Handbook. Country Profile: Algeria (PDF). Library of Congress, Federal Research Division. The Library of Congress: 3. 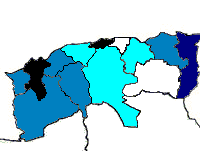 2006 [2007-12-24]. ^ 11.0 11.1 Milton-Edwards, Beverley. Contemporary Politics in the Middle East. Polity. 2006: 28. ISBN 0-7456-3593-8. ^ Stone, Martin. The Agony of Algeria. Columbia University Press. 1997: 31–37. ISBN 0-231-10911-3. ^ 13.0 13.1 Churchill, Charles Henry. The Life of Abdel Kader, Ex-sultan of the Arabs of Algeria. Chapman and Hall. 1867: 270. ^ 14.0 14.1 14.2 14.3 14.4 Grenville, J. A. S. A History of the World from the 20th to the 21st Century. Routledge. 2005: 520–30. ISBN 0-415-28955-6. ^ 15.0 15.1 Kantowicz, Edward R. Coming apart, coming together. Grand Rapids, Mich.: W.B. Eerdmans. 2000: 207. ISBN 0-8028-4456-1. ^ 16.0 16.1 16.2 16.3 16.4 16.5 16.6 16.7 Kacowicz, Arie Marcelo; Pawel Lutomski. Population Resettlement in International Conflicts: A Comparative Study. Lexington Books. 2007: 30–70. ISBN 0-7391-1607-X. ^ ALGERIA: population growth of the whole country. Populstat.info. [11 January 2018]. 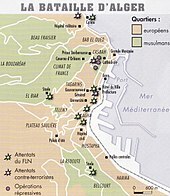 ^ Timelines : History of Algeria. Zum.de. [11 January 2018]. ^ The Agony of Algeria By Martin Stone published by Columbia University Press, 1997. ISBN 0231109113, page 32 (source for pieds-noir population in 1836 and 1847). ^ Pied-Noir. Encyclopedia of the Orient. ^ 23.0 23.1 23.2 23.3 23.4 23.5 Stora, Benjamin. Algeria, 1830-2000: A Short History. Cornell University Press. 2005: 12, 77. ISBN 0-8014-8916-4. ^ 24.0 24.1 Goodman, Martin; Cohen, Jeremy; Sorkin, David Jan. The Oxford Handbook of Jewish Studies. Oxford: Oxford University Press. 2005: 330–40. ISBN 0-19-928032-0. ^ Grobman, Alex. Genocide: Critical Issues of the Holocaust. Behrman House, Inc. 1983: 132. ISBN 0-940646-38-2. ^ 26.0 26.1 Courrières, Yves. La Guerre d'Algerie. Fayard. 1968: 208. ISBN 2-213-61121-1. ^ 27.0 27.1 27.2 Meredith, Martin. The Fate of Africa: A History of Fifty Years of Independence. PublicAffairs. : 74. ISBN 1-58648-398-6. ^ Monneret, Jean. Oran, 5 juillet 1962. Michalon. ISBN 2-84186-308-5. ^ Horne, Alistair. A Savage War of Peace: Algeria 1954-1962. The Viking Press. 1977: 533 and 537. ISBN 0-670-61964-7. ^ Pieds-noirs (France). flagspot.net. [11 January 2018]. ^ 31.0 31.1 French migration to South Australia (1955-1971): What Alien Registration documents can tell us. Vol. 2, Issue 2, August 2005. Flinders University Languages. [2007-12-25]. ^ Sempere Souvannavong, Juan David. Les pieds-noirs à Alicante. Revue européenne de migrations internationales. 11 January 2018, 17 (3): 173–198 [11 January 2018]. doi:10.3406/remi.2001.1800. ^ Alba, Richard; Silberman, Roxane. Decolonization Immigrations and the Social Origins of the Second Generation: The Case of North Africans in France. International Migration Review (Blackwell Synergy). December 2002, 36 (4): 1169–1193 [2008-05-12]. doi:10.1111/j.1747-7379.2002.tb00122.x. ^ Dine, Philip. Images of the Algerian War: French Fiction and Film, 1954-1992. Oxford University Press. 1994: 189–99. ISBN 0-19-815875-0.